Flexible endoscope is an optical instrument which is used to examine or detecting problems in interior part of body. In past few years the demand of flexible endoscopes has been increased in operation rooms and pre surgery treatments as it minimizes the post surgery complications. Rapid growth in ageing population suffering from cancer, gastrointestinal infections is raising the patient preference towards endoscopy, thus increasing the demand of flexible endoscopes devices. In 2016 nearly 22 million people suffered from chronic gastroesophageal reflux disorder (GERD) out of which only 12 million people used medical treatments. Increasing demand of endoscopy is contributing in favorable reimbursement policies which are significantly boosting the requirement of flexible endoscopes in gastrointestinal endoscopy. Minimal invasive therapy is an advanced innovation in endoscopic procedure. Top players of flexible endoscopes market are introducing equipments with advance designs to provide comfort and precision during diagnosis. In January 2016, Boston Scientific Corporation introduced LithoVu, a single-use digital flexible ureteroscope to diagnose and treat stones for minimally invasive surgery. This new flexible ureteroscopes is a cost-effective solution which helps in providing high resolution images and accurate navigation. However, preventive measure to avoid infection taken during endoscopy procedure is a vital part and where government is also participating to set up standard regulations for cleaning endoscopes. For instance, in 2016, the Society of Gastroenterology Nurses and Associates (SGNA) Inc. of Chicago, introduced prevention and cleaning standards for flexible endoscopes and all hospitals and surgery centers should change the conventional practices for cleaning flexible endoscopes. In the same year, the Association of preoperative Registered Nurses (AORN) of Denver, introduced “Guideline for Cleaning and Processing Flexible Endoscopes and Endoscope Accessories” which covered pre-cleaning, visual inspection and storage of flexible endoscopes. Rising number of hospital, healthcare investments and growing preference for invasive surgeries are driving the growth of endoscope market across the globe. The global endoscopy equipment market is expected to grow at a CAGR of 6.24% over the forecast period of 2016 to 2024. The global flexible endoscopes market is anticipated to reach USD 6.31 million by 2024 from value USD 3.92 million in 2016, growing at a CAGR of 6.13% over the forecast period of 2016 to 2024. Based on end-user, hospital segment is expected to dominate the flexible endoscope market owing to the availability of various endoscopic devices in hospitals. Nearly 50% share of flexible endoscope market is occupied by hospitals segment. However, diagnostics labs are expected to witness significant growth and projected to occupy 30% share of global flexible endoscope market over the forecast period of 2016 to 2024. Based on application segment, the gastrointestinal endoscopy segment is anticipated to account for the largest share of the market. Rising number of infections or abnormalities in function of gastrointestinal tract is increasing the demand of flexible gastrointestinal endoscopic devices. North America is the dominating region for flexible endoscopes market followed by Europe. Improved reimbursement policies and implementation of advance technologies is expected to drive the expansion of endoscopes market in North America and Europe region. North America is expected to reach value USD 2.52 million by 2024 from value USD 1.57 million in 2016. Whereas, Europe flexible endoscopes market valued USD 1.18 million in 2016 and is projected to reach value of USD 1.89 million by the end of 2024. Low risk procedure and favorable recovery by health insurance is a major factor which is raising the adoption rate of flexible endoscopes in the UK, France, Germany and other European countries. 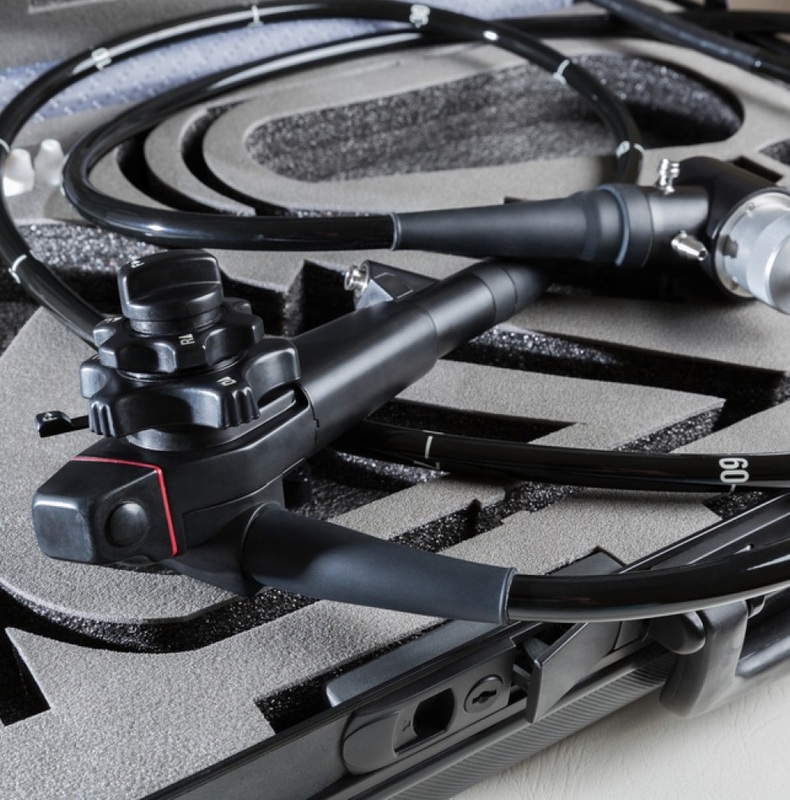 Increasing government spending in healthcare and growing awareness among patients regarding minimally invasive surgeries is expected to improve the flexible endoscope market in Latin America and Middle East & Africa region. Brazil & Mexico together held 60% share of the market in 2015, owing to the increasing awareness and rising number of hospitals in the region. Moreover, rising number of clinical services in the UAE, Israel and Nigeria is driving flexible endoscope market in Middle East &Africa region. Asia-Pacific flexible endoscope market valued USD 0.81 million in 2015, and expected to witness significant growth over the forecast period, owing to the increasing number of clinics and private hospitals in the region. Improvement in rural health facilities and advancement in medical technologies are playing a vital role in the expansion of flexible endoscope business in Asia-Pacific region. Rising health awareness and demand for early stage diagnosis is propelling the demand of flexible endoscopes in invasive surgeries. Growing popularity of minimally invasive therapies and advancement in medical system is boosting the flexible endoscopes market. Increase in investment of endoscopy instruments by hospitals due to rising patient preference for minimally invasive surgeries and favorable reimbursement policies is driving the growth of flexible endoscopes market. Technological advancement, rising investment by government, growing prevalence of chronic health conditions and geriatric population which requires endoscopy procedures are major factors accelerating the flexible endoscopes market across the globe. Stomach infection, perforation, or a tear of the stomach or esophagus lining and bleeding during the process of endoscopy is limiting the patient preference for flexible endoscopes. Changing regulations related with medical equipments and worldwide currency devaluation is majorly impacting the flexible endoscopes business.